LANSING — The November election may be 10 months away, but some campaign donors have already made max contributions in support of their preferred candidates for governor. According to a review of fundraising disclosures, about 318 donors contributed the maximum amount allowed to at least one candidate for Michigan governor by the end of 2017. Voters will pick a new governor in November 2018. More than a dozen candidates have been actively raising money to run for governor, according to fundraising disclosures that were due to the Secretary of State’s Office on Jan. 31. Combined, the candidates’ official committees have raised about $16.6 million. More than half of that money came from either the candidates themselves through personal contributions or loans to their own campaigns— about $6.8 million — or from about 318 donors who chipped in the maximum amount to at least one of the contenders — roughly about $2 million. 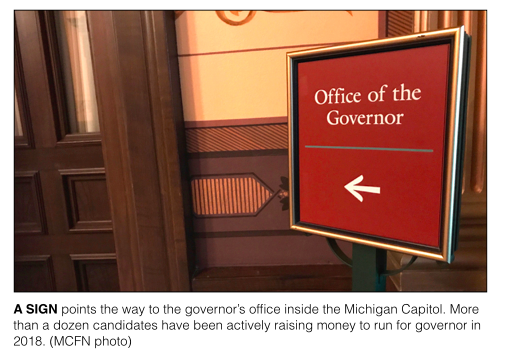 Under Michigan’s campaign contribution limits, individual donors can give the campaign of a candidate for governor up to $6,800 per election cycle. Political action committees (PACs), however, can give 10 times that amount to a candidate: $68,000. State lawmakers voted to double the contribution limits in 2013. With that said, donors can give unlimited amounts to groups that work independently of the candidates’ campaigns but still advocate for the candidates. A Super PAC that is supporting Attorney General Bill Schuette, Better Jobs Stronger Families, has raised $536,459 with $500,000 of the haul coming just two donors: Kojaian Properties of Bloomfield Hills and Oakland Financial Corporation of Sterling Heights. Oakland Financial is tied to businessman Matthew Moroun. Candidates themselves can give their own campaigns unlimited amounts of money. Democrat Shri Thanedar, a businessman from Ann Arbor, has given his campaign $5.993 million so far. The campaign has raised $5.996 million, including both direct contributions of money and in-kind contributions of goods or services. According to MCFN's analysis of Kantar Media CMAG ad-tracking data, the Thanedar campaign had already run an estimated $479,930 in broadcast TV ads in Michigan as of Feb. 5. Republican Jim Hines, a doctor from Saginaw, has given his campaign $673,631, according to campaign finance disclosures. The Hines campaign has reported raising $779,289 overall. Neither the Thanedar campaign nor the Hines campaign has reported receiving a maximum contribution from an individual donor yet. The wide majority of the about 331 maximum contributions the Michigan Campaign Finance Network (MCFN) tracked went to four candidates: Republican Brian Calley, of Portland, the lieutenant governor; Schuette, a Republican from Midland; Democrat Gretchen Whitmer, of East Lansing, the former Senate minority leader; or Democrat Abdul El-Sayed, a doctor from Southeast Michigan. 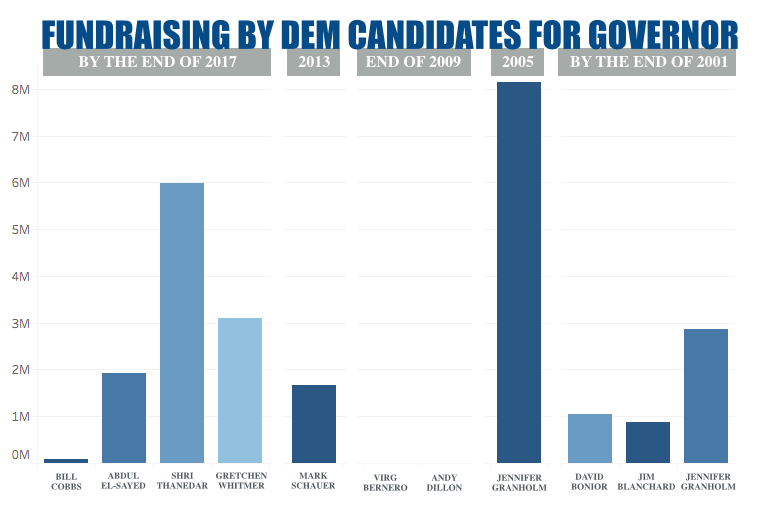 Some of the maximum contributions came from donors who gave to a past committee before the candidates formally launched a campaign for governor. The campaigns then transferred the money in for the new committees. 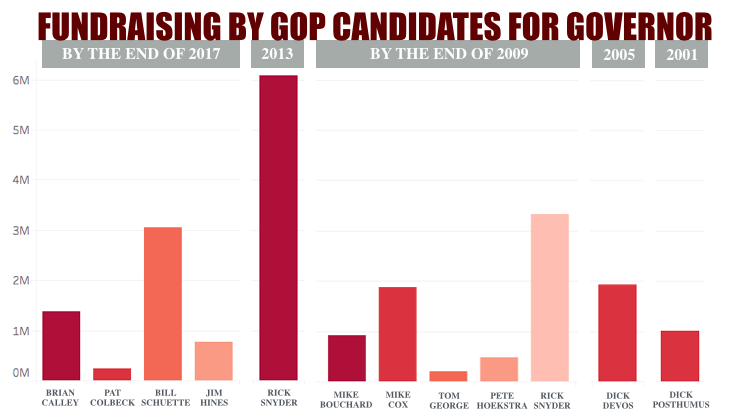 About a dozen contributors have given to multiple candidates for governor. Schuette’s campaign has reported raising $3.04 million total. It’s disclosed about 97 contributors who were listed as giving at least $6,800, the maximum allowed. Whitmer’s campaign has raised $3.10 million. It’s reported about 80 maximum contributors, including the Michigan State Utility Workers PAC, which gave $68,000. The utility workers PAC is the only PAC that’s maxed out to a candidate so far, according to MCFN’s analysis of the available disclosures. Calley’s campaign has raised about $1.38 million. Calley’s gubernatorial campaign received about $1.23 million in transfers from his previous fundraising committee for lieutenant governor. Because of a software issue, Calley’s gubernatorial campaign hasn’t fully itemized yet which contributions have been transferred. If the contributions were made this election cycle, they would count against the current contribution limits. About 80 contributors have given the maximum this election cycle to Calley’s committee for lieutenant governor, but it's unclear whether all of those contributions will transfer to Calley's new committee for govenror. El-Sayed’s campaign has reported raising $1.92 million. It’s reported about 60 maximum contributors. Multiple candidates reported one or two contributors as giving more than the legal limits allow. But it’s likely the campaigns have already refunded the excess money or the campaigns will be forced to return the excess money in the near future. Here’s more information on the fundraising reports of candidates for governor who’ve raised more than $100,000. Lists of maximum contributors are also listed below as they were reported to the Michigan Secretary of State. Note: Thanedar has provided about $5.99 million for his own campaign. Note: A listing of contributors who gave the maximum amount appears at this link. Note: Hines has provided $673,631 in support for his own campaign.